Located near the on-ramp to the Arthur Laing Bridge and Marine Drive, the midden is an ancient Musqueam village site. Protesters fought for months to have a proposed five-storey commercial and residential project on the site halted after human remains were found on a section of the site. On Friday, the B.C. Ministry of Lands and Forests said it would not extend a permit for the developers, Century Holdings, to alter the site. Century Group spokesperson Bob Ransford says the move will have a chilling effect on other land owners. "By removing the permit to alter this site, the province has basically said to private land owners, 'You can't do anything with your site because we believe that there's some archaeological resources on that site,'" he said. "And they have no intention of compensating us." The Musqueam Band, meanwhile, says it "is pleased that the proposed development is no longer authorized by the permits issued by the Province and that the ancestral remains are to be restored to their original condition." The band noted that the site was declared to be a National Historic Site in 1933 as one of the largest pre-contact middens in Western Canada and it has special significance for Musqueam. The band noted that the midden has been deemed by UBC scholar Bruce Miller to be "one of the most significant archaeological sites in Canada." 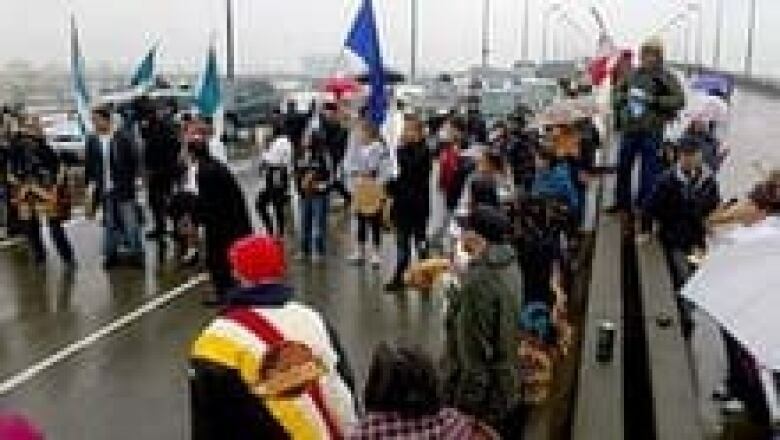 "Musqueam looks forward to being actively involved in the steps to be taken to restore the ancestral remains in accordance with Musqueam customs and beliefs, steps that must be taken immediately to prevent further deterioration," the band said in a release.